Hey! I want you to get the most out of this blog, so here are some hints! If you are viewing this on a mobile device, you mostly likely won't see everything this blog has to offer. To see the sidebar info: Brady's picture, introduction, subscription information, search box and so on, click the little link at the bottom of your mobile screen that says "View Web Version." See it? The words will be tinier once you push it, but you'll be able to navigate, search, subscribe and more! I plan to post every Wednesday. It will help to get you through the week that way. Ha! So plan on that, and I will do my best. Feel free to comment. I do sometimes get inappropriate comments (can you believe that? ), so they all have to get approved by me first. Just know that I will get yours and approve it when I get a chance. I am raising a toddler, you know! Thanks for coming with us on our journey. 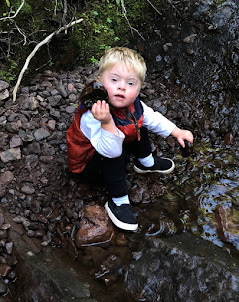 I look forward to advocating for people with Down syndrome, kids in general and Mother Nature. We will see you Wednesday! I worked with children like Brady P. for 21 years & I definitely appreciate not only how you're working with him but him as well. I have been retired since 1988 but the kids I worked with are still "my people" Keep up the good work, Amanda. You both will be rewarded .